Gum disease starts out as a mild case of gingivitis, but it can progress to periodontitis, a disease that can cause severe damage to the bones and soft tissues in your mouth. The dental hygienists at Heinbach-Larkin Dental perform extensive gingivitis screening at your regular checkup and offer expert care when gingivitis turns into periodontitis. Contact one of their offices in Topeka and Lawrence, Kansas, or schedule an appointment online if you’re due for a checkup or you’re experiencing symptoms of gum disease, like bleeding when you brush. Gum disease begins when plaque, a coating of saliva mixed with bacteria, builds up on your teeth. If you don’t brush regularly to remove plaque, it hardens into tartar. The bacteria stuck to your teeth cause gingivitis, the first stage of gum disease. Gingivitis is easy to treat in its early stage. When it goes untreated, however, the infection spreads and gingivitis advances to become a serious form of gum disease called periodontitis. When you have periodontitis, the ongoing infection produces toxins that damage gums and destroy the bone that supports your teeth. As a result, teeth start to loosen, putting you at risk of losing your teeth. You can prevent gingivitis with consistent brushing and flossing. Regular dental checkups are also important for prevention and treatment. 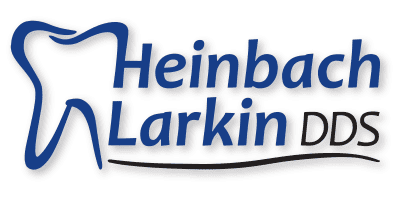 The licensed dental hygienists at Heinbach-Larkin Dental perform comprehensive gum disease screening; they then treat gingivitis with thorough cleaning and scaling, or scraping, to remove plaque and tartar. They also create an individualized at-home treatment plan that may include special toothpaste, mouthwash, and prescription treatment trays. Treatment for periodontitis depends on the severity of the disease. Moderate cases can be treated with a combination of antibiotics and deeper cleaning, involving scaling and root planing (a process that removes bacteria from root surfaces and prevents further tartar buildup). Advanced cases of periodontitis may require surgery to reduce the size of pockets between gums and teeth or to rebuild bone and gums damaged by the infection. If you have advanced gum disease, your dentist at Heinbach-Larkin Dental will talk with you about your options.